A potluck is a great way to spend time with friends and family, and bring the kids together to play. 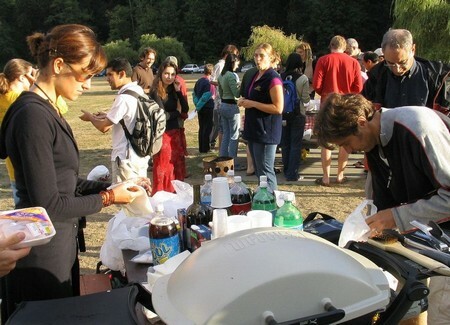 Weekends and holidays are particularly ideal for potlucks, and if your venue is at a regional park or at your spacious backyard, what’s more perfect than having barbecue? Although potlucks and group events are generally stressful, you can reduce your stress by organizing your potluck. Plan your menu weeks before your scheduled potluck. Ask your guests what dish they would like to bring. Jot down all the dishes and make sure no two people will bring the same dish and make sure they don’t bring too many meat or too many salads. You can group the menus into: main dishes, salads, beverages, desserts, equipment / plates / cutlery / napkins, etc. If the guests don’t know what to bring, give them the options or give them the list of menu to select from. Let them choose but make sure someone has not already chosen the food or item that they want to bring. If your guests don’t cook or don’t know how to, they can bring beverages, ready-made desserts, or fruits in season. They don’t have to bring home-cooked meals and are welcome to buy food from stores like Costco or Safeway. They can also bring table napkins, plates, or anything that does not require them to cook. Create labels for your guests’ dish. Put their names on each label and put the label on the bottom of each dish. This comes in handy at the end of the party so you won’t mix-up bowls and dishes and you know exactly who to return the dishes to. Remind your guests to label their dishes with allergenic ingredients. Some of these ingredients include nuts, shrimps and other shellfish, eggs, etc. This will truly help your other guests who are allergic to these ingredients avoid such dishes. Use place cards in front of each dish and write down the ingredients. Include the name of the dish as well so your guests know exactly what they’re getting and you and your guests don’t have to explain what their dishes are. To minimize the risk of spoiling your food, keep hot dishes hot, and cold dishes cold. Include large bowls of ice to place salads that contain mayonnaise and crock pot slow cookers to keep food warm and flavorful. If you’re having your party outdoor, make sure there is a power outlet for you to plug your slow cookers. Put plenty of serving spoons on your table so your guests won’t have to ask you if they need something to dip into a dish. Provide a serving spoon for each dish to avoid cross-contamination of hot and cold, main and dessert dishes. Group dishes according to type, i.e., desserts in one area, appetizers in another area, beverages in a separate area, etc., so guests know exactly where to go if they want more of the kind. Minimize the mess by cleaning up the clutter several times during the party. Ask help from a friend or co-host with refilling dishes or with clearing the trash. Place one or two garbage bins in the food area so guests can dispose of the trash on their own. Socialize, interact with your guests and enjoy the party!